In general, each project may be subsidized for about 250 hours per semester. Our regular funding will subsidize $5.00 of the student's hourly wage. Additional funding has been made available as a result of a referendum of the Arts Undergraduate Society to create career-related Work Study positions in the Faculty of Arts. This funding allows the Work Study program to subsidize selected research positions in the Faculty of Arts that are filled by Arts undergraduate students. The subsidy is valued at $10.00 of the student's hourly wage. Additional funding has been made available as a result of a referendum of the Science Undergraduate Society to create career-related Work Study positions in the Faculty of Science. This funding allows the Work Study program to subsidize selected research positions in the Faculty of Science that are filled by Science undergraduate students. The subsidy is valued at $10.00 of the student's hourly wage. Once you have hired a Work Study student, you need to place them on McGill payroll. Contact your payroll/service representative to find out how to do this and what other documents are required. You are responsible for keeping track of students’ work hours on a weekly and cumulative basis to ensure that your total allocated hours for your project are not exceeded. You must submit bi-weekly work hours (timesheets) to the person who is responsible for submitting casual payroll requisitions. It is not acceptable to prepay students for hours not yet worked or to pay students in lump sums. Ensure the student is paid every two weeks at an approved hourly rate that is in accordance with the current Collective Agreement. Enter your 5-digit (no spaces or characters) "Work Study Project Number" in the Ref. field. 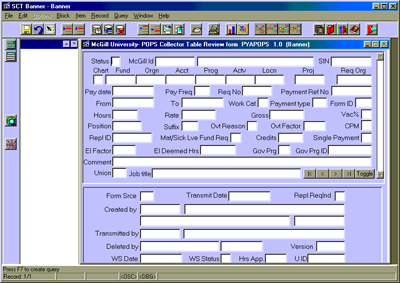 POPS 6.5 is the current method for processing payroll requisitions of Work Study students. Appointment forms will not be accepted. Subsidies are reimbursed to departments using the payroll records of Work Study students. Reimbursements are processed on a regular basis—funds will be transferred by journal entry to the FOAPAL from which the student's wages are paid. You will be notified each time a reimbursement is credited to your FOAPAL. Discrepancies should be reported immediately to the Scholarships and Student Aid Office by work.study [at] mcgill.ca (emailing the Work Study team). See Ensuring reimbursements are processed (immediately below) for information on processing and correcting payroll records for Work Study students. Below is an image of PYAPOPS. This form can be used to verify all requests that have been submitted by the payroll person. Modifications can be made to Gov Prg and/or Gov Prg ID only if the WS Status at the bottom of the screen does not show RP (Reimbursement Processed) or A value in Hrs App PLUS a WS Status of ZP (Zero Hours Remaining on Project - for given term). It is important to keep track of the pay period dates. The Work Study dates may differ from payroll dates. the student's approved work period found on the accepted/refused student list. You won't be reimbursed if the student's pay period exceeds the approved end date in a given term. Each project is approved for a given number of hours per term. It is important to track these hours as the reimbursement can only be made if the exact number of hours can be applied. If a project is approved for 225 hours in the Fall term and the student has worked 18 hours per week, by the 12th week the total hours worked by the student will be 216. In the next pay period, if the payroll request is for more than 9 hours (225 approved hours—216 already worked), the reimbursement cannot be processed. You must submit one payroll record for 9 hours with the Work Study indicators and a separate payroll request for the balance of hours worked by the student without any Work Study indicators. You can remove a record from the reimbursement process by deleting the data in both Gov Prg ID and the Gov Prg.